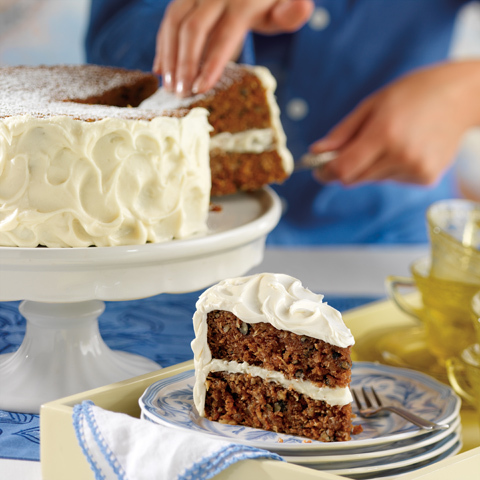 In the beginning, Sheila’s mother drove her famous carrot cakes down to Manhattan daily from her Connecticut kitchen. The cake became a Silver Palate classic; it may now become yours as well. 1. Preheat the oven to 350°F. Grease two 9-inch springform pans. 2. Sift the dry ingredients into a bowl. Add the oil, eggs, and vanilla. Beat well. Fold in the walnuts, coconut, carrots, and pineapple. 3. Pour the batter into the prepared pans. Set on the center rack of the oven and bake until the edges have pulled away from the sides and a cake tester inserted in the center comes out clean, 50 minutes. 4. Cool on a cake rack for 3 hours. Fill and frost the cake with the cream cheese frosting. From the book "The Silver Palate Cookbook" by Julee Rosso & Sheila Lukins. Copyright 2007 by Julee Rosso and Sheila Lukins. Published by Workman Publishing. 1. Cream together the cream cheese and butter in a mixing bowl. 2. Slowly sift in the confectioners’ sugar and continue beating until fully incorporated. The mixture should be free of lumps. 3. Stir in the vanilla, and lemon juice if desired.